Never thought we'd see the day . . . but here it is - time in our kitchen remodel to refinish the floors on the first floor. We had to be out of our house yesterday at 8 am. I've spent weeks preparing. Emptying end tables. Packing up china and crystal. Relocating STUFF from our study closet. Moving our temporary kitchen to the basement. Wanting to pull my hair out. Of course the crew struggled to pinpoint the day in advance when they would begin the floor. Late last week they let me know that they could begin this week. Initially I had hoped that they would kick us out of the house on a Friday, because I don't babysit on Fridays. Plus the weekend. But I elected to get it started on Monday rather than wait four days. No progress for four days - we are too anxious to get this project done for that nonsense. It was a busy weekend. Coach and Eddie went to Iowa with friends for a football game on Saturday. I was thrilled to attend back to back Irish dancing competitions (aka a mind-blowing, time-sucking weekend) with the girls. Translation: we weren't home enough to wrap up the packing. On Sunday I asked Coach to move furniture into the family room and get the boys to pack a bag to stay at my parents' house. He and Eddie shoved whatever furniture they could lift into the carpeted family room. There was still plenty to do when I arrived home from an exhausting day of dancing. No one had packed a bag. Shock. (sorry I have no new pictures, but I can't add pictures to my blog from my ipad - weird and annoying but true. Working off my ipad while I am displaced from my home. Use your imagination to grasp all this stuff minus the furniture and the joy of packing it up). 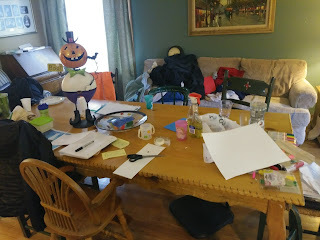 I was beyond tired Sunday night, but I pushed myself to deal with endless piles of crap abandoned after the tables, the piano, and the chairs were yanked out of the room. 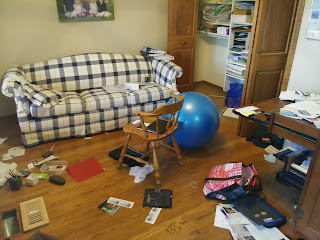 My clearing-the-floor project was unpleasant already, so I was overjoyed when Coach started moaning about moving out of our house for 3 days. It IS true that we intended to vacate the house for a few days in the summer in favor of floor refinishing, but the stars did not align. Translation: the renovation work didn't start as scheduled. Our summer jaunts that were supposed to double as time away for the floors to get refinished didn't double as anything. While I was at dancing, Coach brought Reg over to play at our friends' house. They are also going thru a house makeover. Coach informed me that his buddy claimed that they would not be leaving their home at all - it was a stipulation in their contract. Now Coach was looking at me like moving out temporarily was a choice. I tried to explain that maybe our friends had a tiled entry. Never-mind his buddy's wife had already told me that they were indeed leaving their house this weekend. This led to Coach implying that maybe we just shouldn't have done this project to begin with. Seriously? We've been without a kitchen for about 9 weeks, and NOW he acts like this is a mistake. Because he spent an hour moving furniture? Because we had to relocate to my folks' house around the corner for 3 nights? Honestly, at least my parents' house has a functioning kitchen. Their home also seems to be devoid of mounds of clutter. Translation: I don't want to leave. Until things got really interesting . . .
floors refinished and Halloween - SCARY! Which coach is my Coach? Am I a parent standing in a forest?